Come see just how fun and easy camping can be with this single slide out Wildwood X-Lite 263BHXL travel trailer. This model has double entry doors for easy access into the combined kitchen/living area and the rear door leads straight into the bathroom. Your kids will enjoy their own space with the rear set of bunk beds. Within the slide out there is a U-shaped dinette as well as a sofa where you can enjoy your meals or reminisce about the day, and at night both the sofa and dinette easily convert into additional sleeping space. 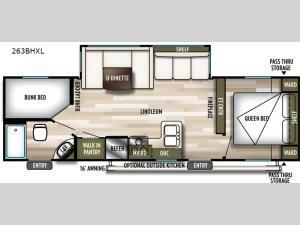 Along the front of this trailer under the front bedroom there is a pass through storage area plus enjoy the shade from the 16' awning and you can even add the optional exterior camp kitchen!